Lightly grease 9-inch square pan with shortening or cooking spray. In 2-quart saucepan, melt 1/2 cup butter and 1/4 cup of the chocolate chips over low heat, stirring constantly. Remove from heat. Stir in cookie crumbs until well mixed; press evenly in pan. Refrigerate until firm, about 10 minutes. Meanwhile, in small bowl, beat 1/4 cup butter, the milk, peppermint extract, vanilla and food color with electric mixer on medium speed until well mixed. On low speed, gradually beat in powdered sugar until smooth. Spread peppermint mixture evenly over crumb mixture. In 1-quart saucepan, melt remaining chocolate chips and 1/3 cup butter over low heat, stirring constantly; spread evenly over peppermint mixture. 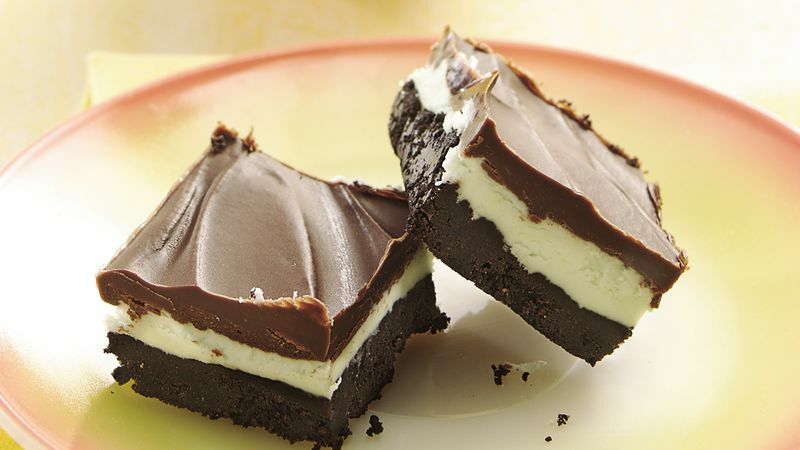 Refrigerate until chocolate is set, 10 to 15 minutes. For bars, cut into 5 rows by 5 rows. To ease preparation, purchase prepared chocolate crumbs. Otherwise, use about 45 chocolate cookies; place them in a plastic bag and press with a rolling pin until they are finely crushed, or crush them in a food processor.